I just switched from Eclipse to IntelliJ. IntelliJ lacks one feature from Eclipse - when you put your mouse over a method, Eclipse shows javadoc info. I think the way to show it is to use a shortcut - command+J, but when I click it, I get something wrong as on the screen shot below. Please advise me on how I can quickly get javadoc information. I need to at least know what type a method returns. Use View | Quick Documentation or the corresponding keyboard shortcut (by default: Ctrl+Q on Windows/Linux and Ctrl+J on macOS or F1 in the recent IDE versions). See the documentation for more information. 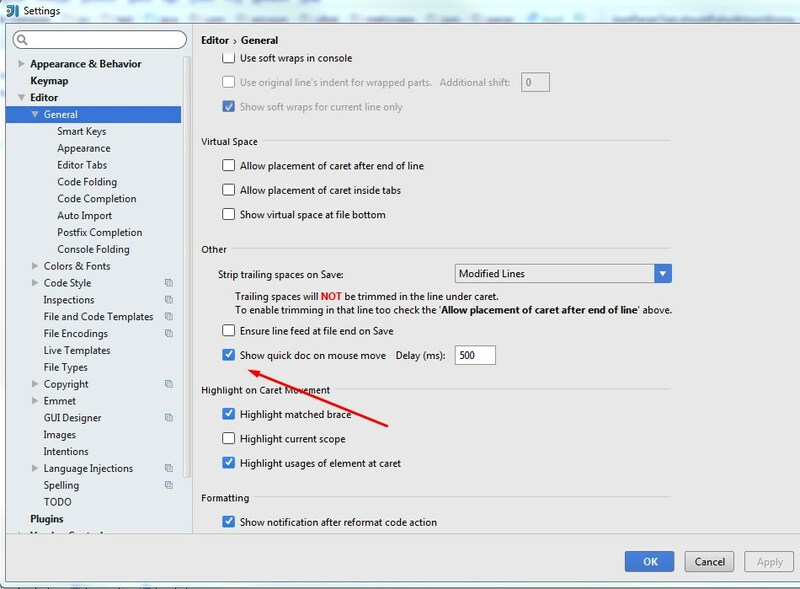 Go to File/Settings, IDE Settings / Editor, then ✔ Show quick doc on mouse move. Go to File/Settings, Editor, click on General. Scroll down, then ✔ Show quick documentation on mouse move. which is the default shortcut. There is nice feature which shows quick documentation when your mouse is over element. To see the javadoc in the autocomplete menu, hit '.' to get the popup, then hover over the object you are working with, once you get the javadoc popup, you can select an item in the popup to switch the javadoc over. Not ideal... But its something. As another note. The search functionality of the options menu is very useful. Just type in 'doc' and you will see all the options for doc. Also, searching for "autopopup doc" will not only find each of the options, but it will also highlight them in the menu. Pretty awesome! Edit: Going beyond the initial question, this might be useful for people who just want quick and easy access to the docs. After using this for a few more days, it seems just getting used to using the hotkey is the most efficient way. It will pop up the documentation for anything at the spot of where your text input marker is so you never have to touch the mouse. This works in the intellisense popup as well and will stay up while navigating up and down. Personally, Ctrl+Q on windows was not ideal so I remapped it to Alt+D. Remaping can be done under IDE Settings/Keymap. Once in the keymap menu, just search for Quick Documentation. Configuration for IntelliJ IDEA CE 2016.3.4 to enable JavaDocs on mouse hover. I am running IntelliJ IDEA on Mac OS but believe that Linux/Windows should have similar options. Now it is available as EAP. 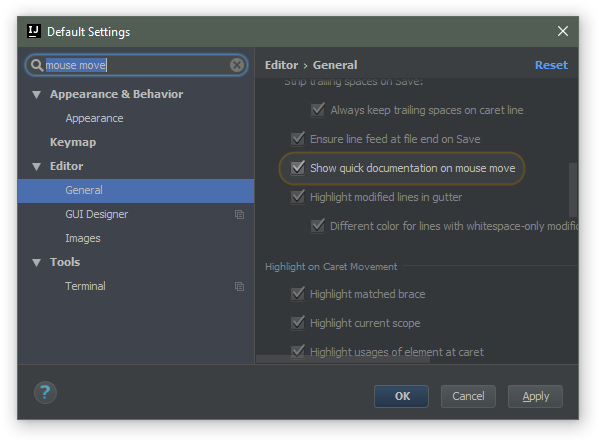 This feature was implemented in IntelliJ IDEA 15 142.4675.3 Release Notes. For me, it wasn't just getting the javadoc window to open, but also getting the complete javadoc to present. You may still get a sparse javadoc that is based solely on the method signature if you are importing libraries from a Maven repository and do not tell Idea to include the javadocs in the download. Be sure to tick the "JavaDocs" option in the "Download Library From Maven Repository" dialog, which can be found under Project Structure -> Projtect Settings -> Libraries. It's called Quick Doc in IntelliJ, I wish guys from JetBrains one day add quick doc like Eclipse with Ctrl+Mouse Move it's so much better. Not the answer you're looking for? Browse other questions tagged java intellij-idea ide javadoc or ask your own question. 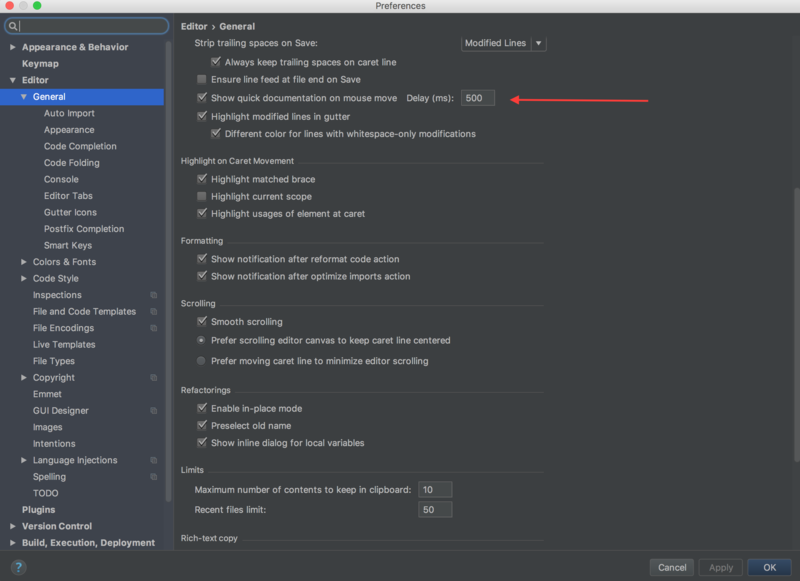 What is Android Studio shortcut to show function return type, parameter type & names all at the same time? Is there a “quick documentation” shortcut for VS code? 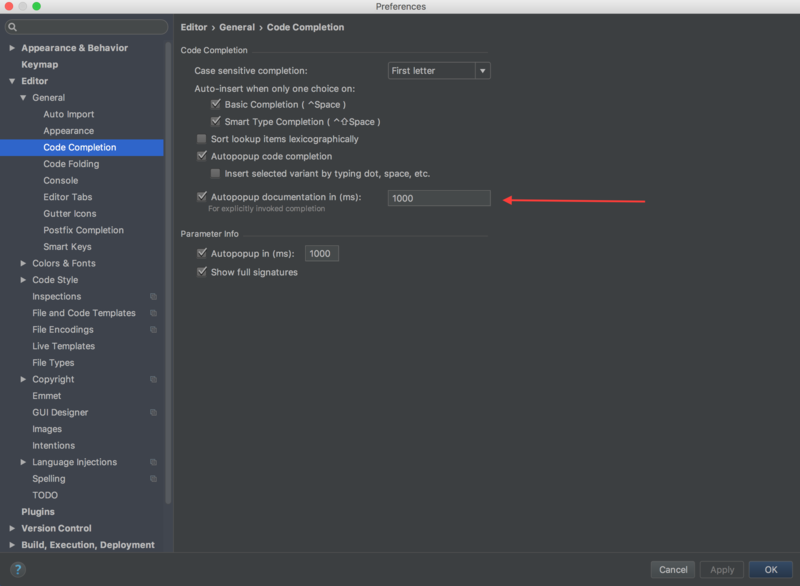 How to make IntelliJ display the Javadoc of autocompletion suggestions? How to make javaDoc in IntelliJ IDEA smart as Eclipse? 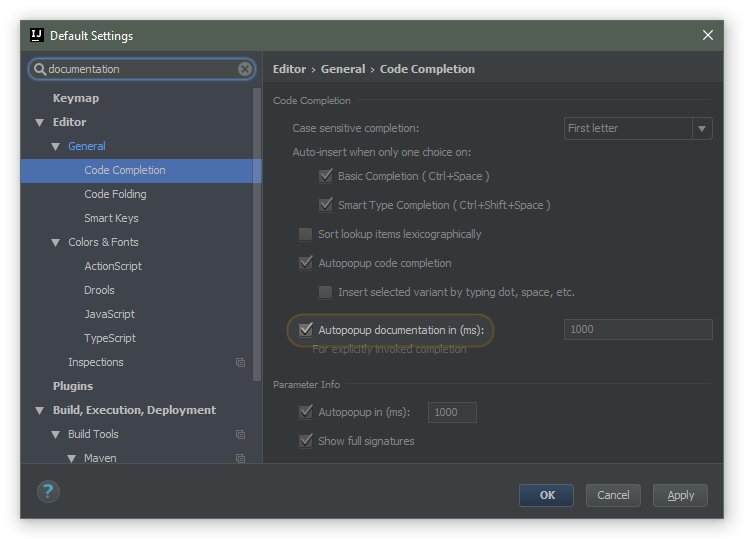 What is the difference between Quick documentation and Autopopup documentation in Intellij IDEA?